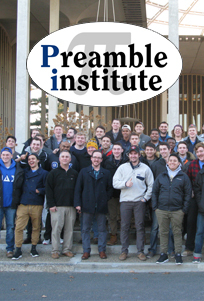 We have just returned from the 11th Annual Preamble Institute, the second largest Pi ever! What a wonderful event it was. This year’s Pi was hosted at the University at Albany with forty-six attendees and eight facilitators. Thanks to the sponsorship from the Educational Foundation and the substantial funds raised during Founder’s Day of Giving, Charges’ sent a generous number of extra delegates to Pi. The Preamble Institute is our signature retreat to cultivate, teach, and engage raising leaders within our Charges. This year Pi focused on leadership styles and practices, building a network, and communication skills to assist our delegates in navigated through all future endeavors. We also conducted educational sessions aimed at providing delegates with tangible strategies to institute change at their respective Charges. These sessions included: exploring the Ritual of our Fraternity, identifying the values of Theta Delta Chi and living them today, recruitment and new member education programs, and how to increase service and philanthropic efforts through Autism Speaks. I hope that all brothers understand and recognize the value in this type of programming. Through workshops and programs like Pi we are closer to achieving our vision of every Charge being Victory Cup worthy. We will continue to cultivate a small, intimate, and diverse brotherhood focused on scholarship leadership and a responsible social life. I am therefore proud tonight, more proud than I ever thought I could be, of having participated in the foundation of the greatest of all fraternities. I am sure that I need not regret it; I am sure that it may always be a source of pride. When I look into the faces of these young men today, and when I look into the faces of the older ones here about me, I feel that our fraternity must endure and be a noble and useful institution for all time.